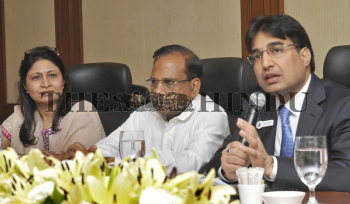 Caption : HYDERABAD (AP/ BL/ REPORT: AMIT MITRA ) -22-03-2011- Mr. Ashok Goel , president , Plastindia Foundation speaking on the forthcoming 8th International Plastics Exhibition ; in Hyderabad on Tuesday . From left are Ms. K. Padmaja Reddy , Chairman of South Zone , Mr B. M. Bansal , National Advisory Board of Plastindia . PHOTO: P_V_SIVAKUMAR .